Anything relating to 3D printing can be discussed here. Following the successful funding of an Open Source project the V-Slot (which is essentially an extruded aluminium section which is both a structural building component and a linear guide rail) was born. As a result, a rapidly expanding Open Source community is now applying a fresh approach to existing 3D printer designs as well as experimenting with new designs and solutions to many of the existing problems. This Open Source site has only been up and running for a few months and it is early days for a lot of the builders but there is a great deal of enthusiasm and innovation taking place in the world of 3D printing in general so, if you are interested in 3D printing, it may be worth taking a look here from time to time. The free version is more than adequate for getting started (non-commercial use only) and there are also paid-for versions for commercial and more advanced options. tweakie, very promising! Although I'm not interested in 3D printing, I see how this technique evolves. 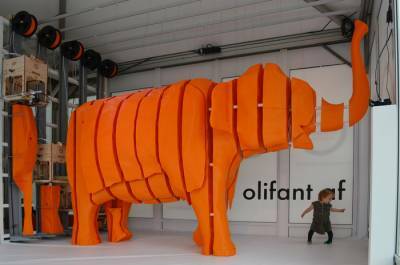 I think it may also be useful for the .stl and creation of 3D relief's ?? Definitely, 3D printing technique evolves in time. Materials, machine and the designs are revolutionary. Everything is becoming a reality now through prototyping. I can't wait to get myself a 3D printer and try minor experiments on prototyping. Any idea what is the best material to date? A PLA filament like this http://www.3d2print.net/shop/product/pla-natural-milky/ is actually ideal for my project. Welcome to the HobbyCncArt forum. I think all of the different types of filament each have their own advantages and disadvantages - it is probably just a matter of trying them to find out which suits your application / machine the best. It is commonly accepted that some materials are easier (for a beginner) to use than others with PLA (similar to your link) perhaps being the most popular. 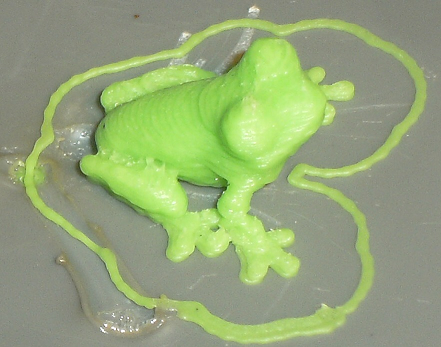 My first printing a frog, which size is 12x12x8 mm, material ABS , color green, print time is 1 hour, because the machine is not designed for this purpose.